I was asked not so long ago to remove a Gollie, such as the one pictured here, from a site. There was no malicious intent. It was simply that the world had gone totally politically correct. It would seem to depend on which way the wind is blowing as to what we are allowed to call things, yet it is perfectly ok for people to call me things I don’t like eg “jock”. I am not trying to be political, simply trying to be realistic. We all get called things we don’t like, sometimes it is down to where we have been brought up. Here in the north east of Scotland a Loon is a boy or male person. Where I grew up in the east of Scotland it was someone with a mental health history. Get me , I am being p.c. about that description! 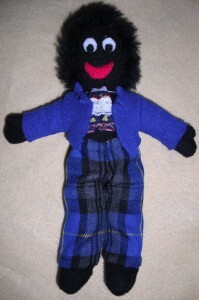 Anyway, common sense sort of prevails in that I can now call my Gollie a Gollie Doll. I think I shall stick with plain Gollie and hope that I don’t run into trouble. It started with a new product mail from Sarah’s Textile Crafts. 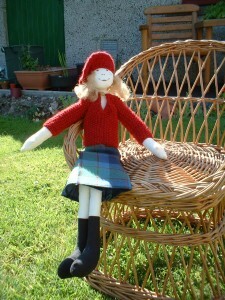 She had packs of curly wool in different colours in pre cut lengths. On looking at them I remembered that I had wanted to make some cloth dolls but had been wondering what I could use for the hair. Suddenly I thought that this might be the answer. When the wool arrived I immediately thought of the tammy I had knitted some weeks previously which still hadn’t found someone to wear it. 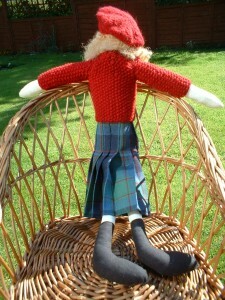 This then linked to a tartan skirt and a knitted jacket just seemed to finish the ensemble. The doll is made in 100% cotton. The tartan is 100% genuine Scottish wool tartan and the tammy and jacket are knitted in 100% lambswool yarn from the New Lanark Mill.